Make commuting easy and efficient for travelers. ITS offers a variety of solutions to enhance the guest experience in your facility. 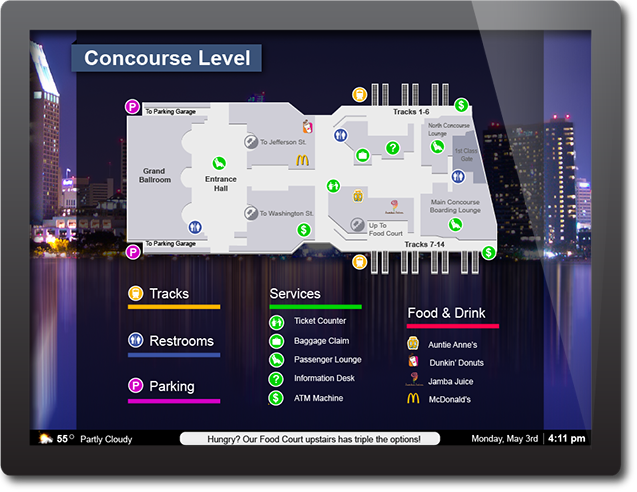 Allow visitors to navigate effortlessly throughout your location with digital building directories. Highlight nearby food and beverage options along the way, and drive additional revenue. We have over 50 years of experience in real-time display systems. 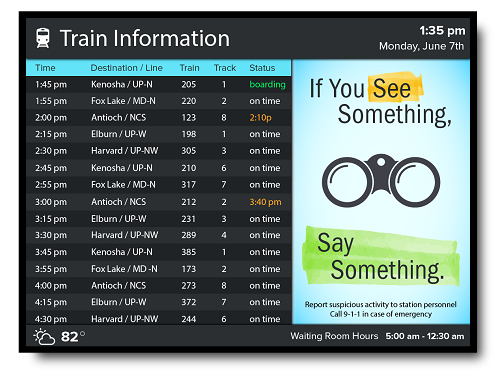 You can be assured our transportation schedule displays are accurate, displaying status changes, delays, and cancellations as they occur. Give your guests the convenience of clear, precise scheduling consistently throughout your location. All of our transportation displays are custom-built to meet the unique needs of each client facility. Contact us today to discuss your application. Guide travelers efficiently throughout your facility. 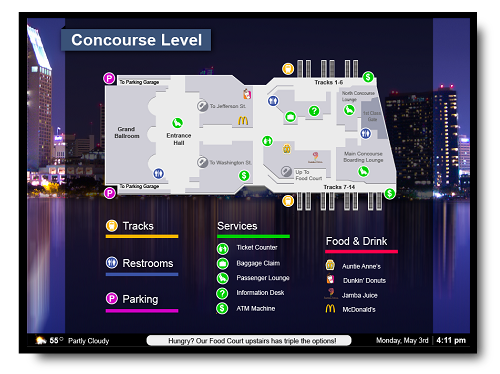 Building Directories allow travelers to easily navigate throughout your station and minimize inquiries at the same time, allowing staff to focus on other rider needs. Indicate where tickets may be purchased and provide luggage retrieval information for added convenience. Showcase restaurant and retail options nearby, and increase vendor sales. Make it quick and convenient for travelers to find their rides. Our transportation schedules are updated in real-time, highlighting any changes to ride scheduling and status as they occur. Display public service messages and enhance emergency preparedness at your location.